Ahh, pestiferous, thorn-covered wild blackberry, now bearing. Non-native pest, but I can't picture Oregon without it. Shot I took in Portland, between my brother's place & a local coffee shop with wi-fi. After a flight somewhere over eight hours, waited & waited for my luggage in San Francisco. And waited, aware of the tight connection in San Fran. No luggage. Turned out luggage never got on the plane in Tokyo. In San Fran missed the 11:37 to Portland, Oregon. For the 2:07 was placed on "high standby," top of lst, but flight was full. Finally on 4:59 to Portland. Off to file a "missing luggage" report. "Oh, your luggage might be here." There it was. 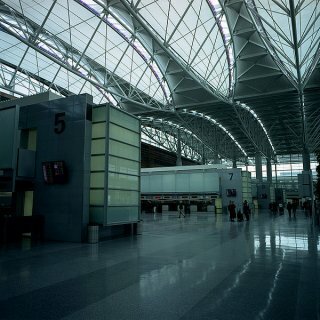 Full disclosure: Public Domain Wikipedia image of SFO's International Terminal. Bottle of Japanese green tea, quite stable, far more stable a ride than the Trans-Siberian that rocked all over the place. Quite a few of the Japanese in the same train were asleep.